Ted Andrews (1952-2009) was a highly acclaimed speaker, teacher and author of over 35 books. 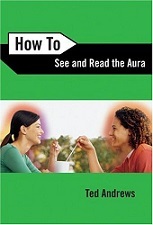 I referenced his book How to Read Your Aura in my posts: Vitalizing & Strengthening Our Aura and Aura Energy Sucking Protection. This book presents simple and effective techniques for cleansing, strengthening, and protecting your own aura. It shares how you can increase your sensitivity, intuition, boost your energy and improve your health. I will be featuring other books by Ted Andrews in the future.